This Winnie the Pooh birthday cake reminds me of the movie when Pooh bear is being the little black rain cloud and is flying up, up to the honey tree. Too cute – have a Winnie the Pooh birthday cake and to compliment the cake have cupcakes with bees, honey pots and the other Winnie the Pooh characters. My daughter had a Winnie the Pooh birthday party when she was turning one because I LOVE Winnie the Pooh! 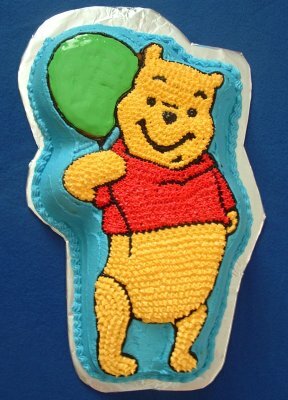 This Winnie the Pooh cake was simple to make. I used a preformed Wilton Winnie the Pooh cake pan and made a regular yellow from a box cake mix. Make sure you use ample non stick spray to get into all the crevices of the cake pan. I baked the cake at 350 degrees and it took about 35 minutes (they suggest between 30-40 minutes). I made a nice butter cream icing. I made it extra thick to add some detail into the cake. I decided that I wanted the outside of my Winnie the Pooh character to be blue so it would look like he was flying up into the sky. I used tip 789 with the smooth side out. You could also use tip 47 again use the smooth side out to get the same effect. If you use the smaller tip you will go around your cake three times to get the height. Both of those tips are great so that your cake will not show crumbs (smooth again with an angled spatula). Next, I switched to black icing (make from chocolate) and tip 3. I did all my outlines and also piped in the face of Pooh bear. After this was completed I went back to my outside blue color and put on tip 5 and I filled in the rest of the blue filling in right up to the black outline. Next, I made the red star design (red is difficult to create – tint your icing pink and then make red). To make the star design I used tip 16. Then, I used the same tip 16 to create the fur on Winnie the Pooh. To finish off my Winnie the Pooh cake I made the balloon green. I used tip 5 and then in an egg cup I mixed a small amount of cornstarch with warm water. I dipped my finger in the mixture and tapped down the green color. It will make the balloon look smooth and shinny. I loved the way the Winnie the Pooh cake turned out! After I finished making the cake I looked out my kitchen window and thought of Christopher Robin. It looked a little cloudy and all I could say was “tut, tut, it looks like rain”.